Photograph from an album of 30 prints credited to Herzog and Higgins, taken in ca. 1901 and part of the Curzon Collection. 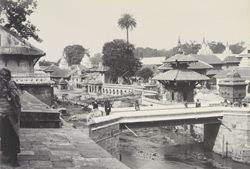 A view of the bridge linking either side of the Bagmati river near the Pashupatinath temple, the most venerated Hindu shrine in Nepal. The temple is dedicated to Shiva in his aspect as Pashupati, Lord of Animals, the state deity of Nepal. The Bagmati river is Nepal's largest river and also its holiest, and its banks near Pashupatinath are lined with stepped embankments and stone platforms for cremating the dead and for ritual bathing.